Same password as before. E-mail me at littlerainbowbug@gmail.com or message me on Facebook. Bloggers only please. Lines are deceivingly simple figures. What appears so basic is really an infinite number of points shooting off in opposite directions. Parallel lines have always intrigued me. Infinite points that never intersect. Darkening parallel lines. Infinite possibility. It’s been a long morning of toddler whining and working around messes that aren’t mine. In this moment I’m wishing for an hour or two that I could have to myself that did not require I be working. I suppose I could at least make some coffee. I’ve been relatively cryptic in my recent posts so I’ve finally decided to write up some password protected posts that I’ll make public later. If you’re reading this while it’s private then you are either among a very small number in our lives that we know and have given a password to, or we know each other only through the land of blog. In July, Leah started tracking her cycles in anticipation of trying to get pregnant in September. That was the first month she realized her luteal phase was really short. Like, 9-10 days rather than the usual 14. For those of you who have dealt with trying to conceive long enough to know your cycle, you may know that a short luteal phase is a very bad thing when it comes to conception. It’s responsible for all sorts of things, from not getting pregnant at all (hard) to having reoccurring miscarriages (really effing hard). We hoped it was a fluke. Due to the realization that we essentially had a three month window to get her pregnant before the summer would be eaten and she would have no time with a newborn before starting fall classes, we ended up trying for the first time in August. Another short cycle, no luck with the possibility that it was a fluke. Step one was to try using Vitex to help boost her progesterone and lengthen her luteal phase. She started as soon as she confirmed she wasn’t pregnant in August. September came and we tried again, hoping that the Vitex was helping. (Have I mentioned that our donor is a rock star?) No luck. Another short cycle, in spite of confirming ovulation. The reality of PMS symptoms mirroring early pregnancy is an evil that knows no bounds. At least Leah has been tracking her temperature, so she’s been able to see the drop on the day when she eventually starts her period. So this month came, she tried using Wondfo ovulation tests and never got a positive, but was pretty sure she ovulated based on temperature and cervical mucous (I don’t believe in the concept of “too much information” when it comes to reproduction and adults, so deal or you can stop reading). Our donor came through again and we began the two week wait, or as we had come to know it, the ten day wait. On Saturday I noticed that Leah’s temperature chart was identical to mine (temps within .02 degrees) from the month I got pregnant with Darwin. That was 8 days past ovulation (as best we could tell without a positive ovulation test). She was cramping a bit and the strongest symptom was super sore breasts. This was sounding very familiar, so you can imagine our disappointment when she had a half degree temperature drop on Sunday morning. Then on Monday morning I was woken up by my lovely wife saying “Rachel. 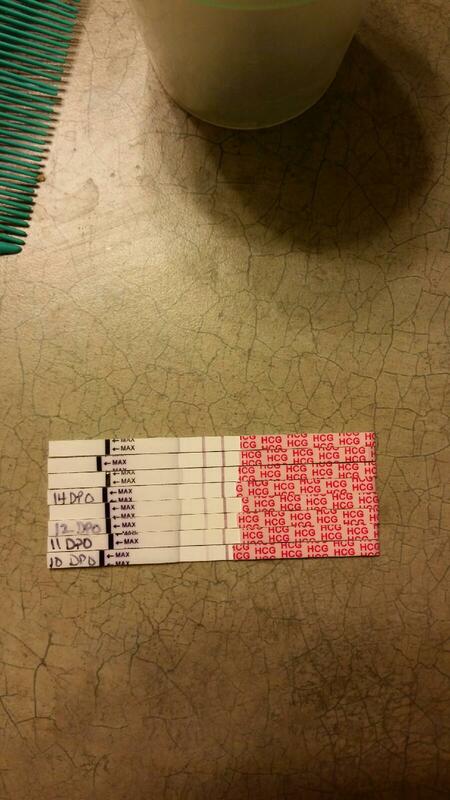 I think I’m pregnant,” and handing me a pregnancy test with a very clear positive line on it. At 10 dpo. This morning, another positive test. Now at 11 dpo. Fingers crossed. 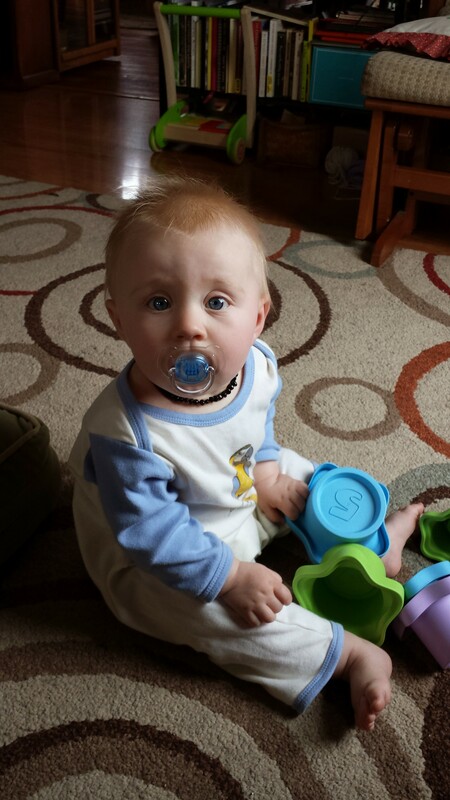 My mother told me that, in spite of her best efforts, neither my brother nor I would ever take a pacifier. She offered it for months before finally giving up. Darwin seemed headed in the same direction, taking it for a second or two everyone once in a while before spitting it out, until she turned 4 months old. At 4 months it was like a switch flipped and suddenly the pacifier was her favorite thing to have in order to go to sleep, calm down in the car, or if she was feeling cranky from teething. In case you haven’t experienced it: being able to give a baby who has been awake way too long and wants nothing more than to bite you if you try to nurse her a pacifier? I mean, just look at that happy face. I’ve seen videos of kids who are 4 or 5 years old who have binkies that their parents take out of their mouths so that they can be understood. I don’t want to get into any issues about whether that is acceptable or not – my premise when approaching parenting situations has become “every kid is different and every parent is different,” but that was not how I wanted to deal with communicating with my kid by that age. So I worried, because that is what I do. I read some articles about pacifier weening. We started trying to only give it to her when it was a sleep aid rather than all the time. And then, rather suddenly, she stopped wanting them. Cold turkey. As of about a week (or two?) ago, she started nursing to sleep again. She even has started to fall back asleep on her own sometimes. She spits out the pacifier when I do offer it to her. Or throws it. Or hits it before it gets to her face. So there you have it, folks. Every kid is different. If your new baby won’t take a pacifier now and you want them to have an option other than the breast? They may latch onto the idea eventually. Or they may not. If your kid is obsessed with the pacifier now, and you can’t leave the room without it? It won’t last forever, there will be a point at which they are done with it, and they will let you know (or not, and it will take you a few days to realize they aren’t using it anymore). Do you have pacifier/soothing method stories to share? I encourage you to do so, because boy, it would have been useful for me to hear that not every kid has to go through a horrific pacifier weening period! I believe this was the last pacifier. Can it really be that easy? Well, I was feeling annoyed with how little I could remember about 12 months, specifically, so here I am at 7 in the morning on the morning of month 13 starting the monthly update. Go me. Edit: it took me all day, but by gosh, I finished it before I went to bed! In spite of all my recent whining and complaining this month has been pretty incredible in a lot of ways. Darwin learned a lot from her sudden, regular time spent with a toddler just a little older than her and a 3 year old. 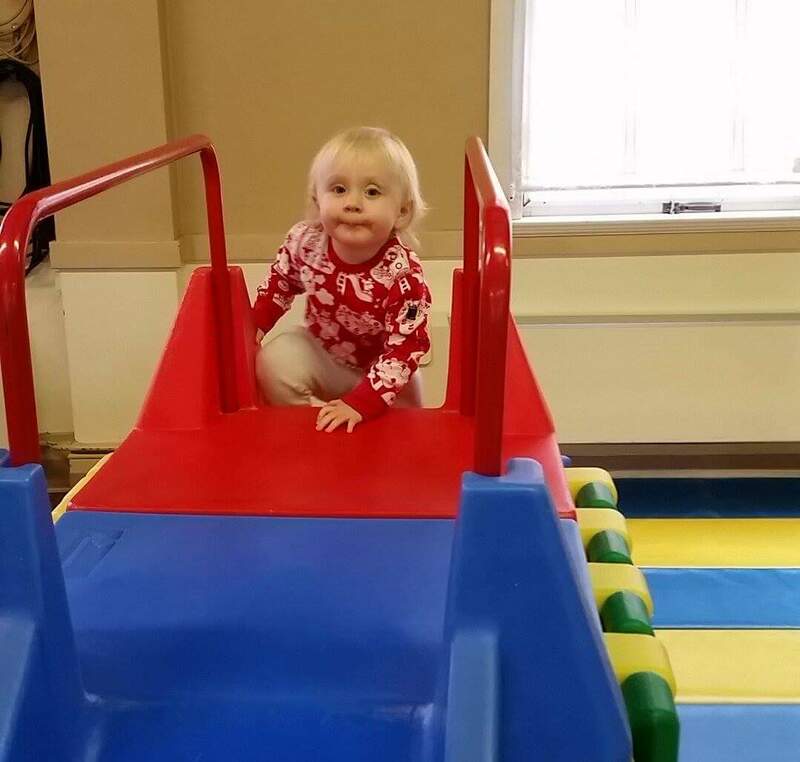 Like going up steps and down the slide on the other side all on her own. Her stats are finally leveling off a bit. Height 30.5 inches; weight 22.6 lbs; head circumference 18.7 inches. I suspect the three illnesses that made up September may have contributed to the slowed weight gain. We shall see at her 15 month appointment. I think I’ll do a 13 for 13 this month because so much has gone unmentioned! 1) Using a spoon to eat. That’s right! It’s not clean but I’d say she gets more than half the food into her mouth. She picked up this skill very quickly by watching her little buddy. We never really gave her the option until this month since she had a tendency of using the spoon to either fling food or gag herself. Now she won’t eat without at least one spoon in hand. Preferably one in each. There are now many foods she will refuse from us on her tray or from a pouch that she will eat off of a spoon. She’s a goof for sure. 2) Nursing has become the best thing in the world again. Darwin really stopped being super excited about nursing after about 4 or 5 months. There was a period where she would only nurse at night (how did we survive that?!?). Also, the three months where she wouldn’t nurse in public, during which she would often pretend to want to nurse until my milk let down, then whip her head away and let me get soaked. I don’t know what the switch was, but she will now ask to nurse (nrssssss) while tugging at my shirt, nurse thoroughly, and often (be still my mama heart) nurse to sleep for naps and at night. Honestly, there were times I wondered if she was self weaning. I’m so glad I stuck with it and we made it this far. 13 months of nursing and counting. 3) Brushing teeth. Now that Darwin has 12 teeth we’re making a point to brush (or let her brush) her teeth at night. The pretend toothbrush motions we mimic in one of her bedtime books seem to be helping her figure it out. She still needs help with her molars, but I think we’re off to a good start. 4) Slides are so much fun. 5) Friends. Darwin has friends. We’ve had babies and young kids that we have spent time with throughout the last 13 months, but now she has begun to show interest in actually interacting. Sometimes it works out (like when she and her little buddy hold hands), sometimes not so much (like when she thinks maybe biting is equivalent to a kiss). It’s amazing to watch her little wheels turning as she figures out how other kids will respond to things she does. Plus now I have other little sweet peas in my life and that’s always a plus in my book. 6) Hugs are becoming a thing. Darwin searches out physical affection now. She will climb into my lap, put her arms around my neck, hand in my hair and lay her head on my shoulder. She is a sweet bug. 7) Reading. No, Darwin isn’t reading words in books, but she will sit for significant portions of time just looking at pictures. She even sat in her little rocking chair this morning and looked through two books all on her own. She’s clearly in the right family! 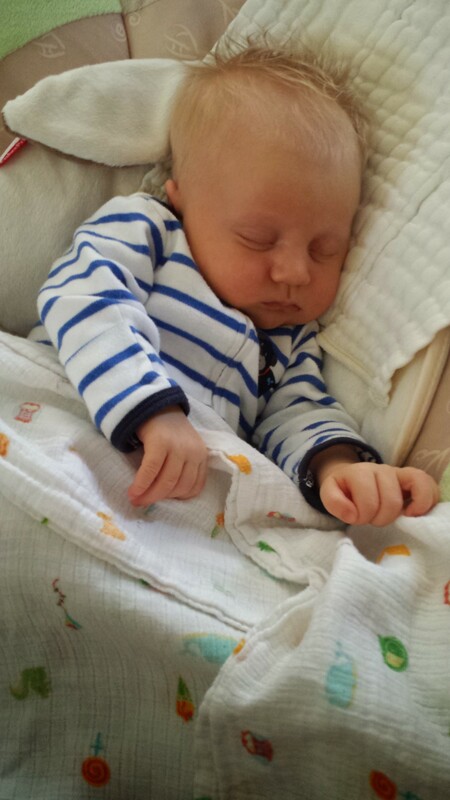 8) Cutting back on morning naps. We’re pushing this a little earlier than Darwin is really ready for as a result of two things. First, she’s fighting naps when she takes two. Taking one afternoon nap generally means I nurse her and she’s asleep in less than 5 minutes, sleeps longer, and is less cranky in the afternoon. Second, her buddy doesn’t nap in the morning, so the only way to nap Darwin is to put her in the Ergo, strap the little dude into the stroller and walk. This requires trying to get Darwin to sleep and keep the little buddy awake. Also, one nap has meant easier and earlier bed times. A shift from 10pm to 8pm? Yes please! 9) Outside is the best ever. Nothing makes Darwin happier than being outside. Especially if there is a slide involved. 10) Food has become a hit or miss activity. Some days Darwin will eat adult sized portions or whatever is served. Most days she smears it all over and tries to feed it to the dog. 11) “Touch” all the things. Darwin wants to put her fingers on everything, and will demand ‘touch’ very persistently now. Sometimes I think she’s actually saying ‘touch that’, but in not convinced yet. 12) “Mama.” Finally, as of last night, or little talker started saying mama. It was the most beautiful sound. 13) Saving the best for last – Darwin started really walking last night (she seems to have a penchant for hitting major milestones on month markers)! I have a nice video of it, but WordPress hates video, so I’ll describe it because it is hilarious. She takes anywhere from 2 or 3, up to about 12 steps right now, hand in the air for balance (see the photo for a slightly less exuberant version). 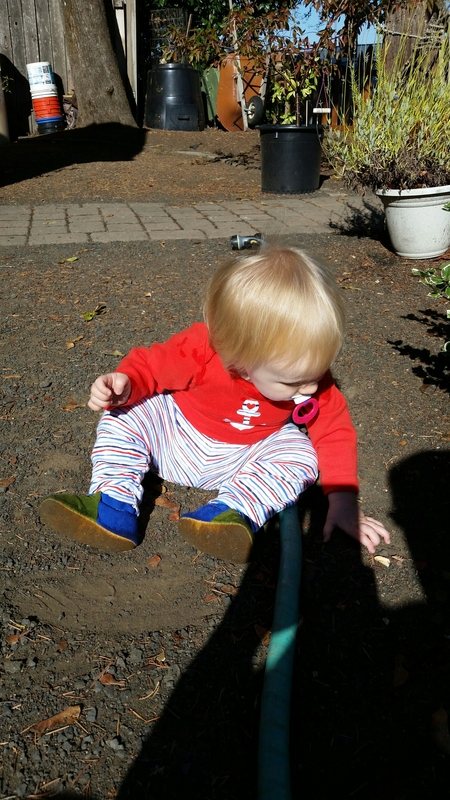 She can get up from sitting on the floor – kid has a better core than me, that’s for sure! So far she seems mostly happy to crawl still unless we put her down on her feet, in which case she takes off walking until she stumbles, then finishes by crawling to her destination.